Most photosynthesis occurs in a biofilm of diatoms, cyanobacteria, and flagellates (e.g., euglena) that is visible at low tide. Coloring the tidal flats green or brown, these microorganisms migrate 1 or 2 millimeters down into the mud just before the tide returns. Green filamentous algae (Enteromorpha spp.) will grow if attachment sites are available. Crabs and snails are common members of the epifauna, permanent residents of the surface. Fiddler crabs are active at low tide; Europe’s shore crabs are active when the mudflat is under water. These animals consume detritus and scavenge beached carcasses. An infauna of copepods, nematodes, and flatworms (turbellarians) is abundant and lives with a macrofauna of bivalves, crustaceans, various types of worm, anemones, and brittlestars—the last two burrowing into the mud. In order to survive low oxygen levels, many have evolved ways to draw oxygenated water into their burrows during high water and store it for use during low water. 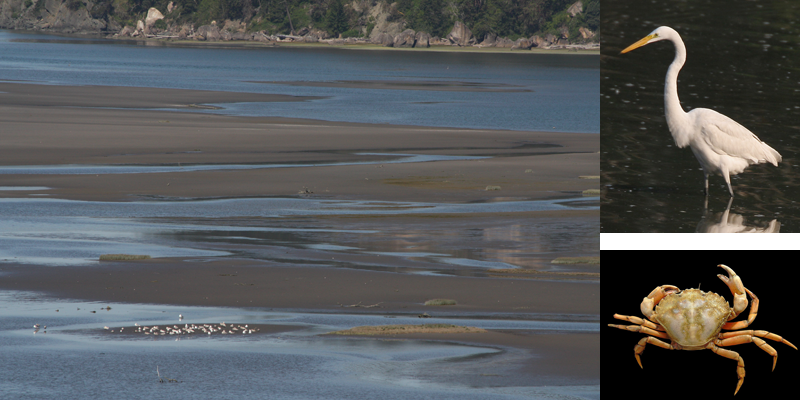 Shorebirds such as herons and egrets are common predators at low tide; fish such as flounders hunt when the flats are inundated. Biomes of the World by S. L. Woodward is licensed under a Creative Commons Attribution-NonCommercial 3.0 Unported License. Author: Dr. Susan L. Woodward, Professor of Geography Emerita, Department of Geospatial Science, Radford University, Radford, Virginia. Content on terrestrial biomes was initially prepared in 1997. Content on aquatic biomes added 2012-2015. Dr. Andrew Foy, Assistant Professor of Geospatial Science at Radford, is web administrator for the site. All pages last updated: 2012 by slw. All photos, unless otherwise noted, are by the author. These photos and the maps may be used without permission for educational purposes on websites and PowerPoints.